Most of us have wrapped our brains, and our palates, around the idea of terroir by now. According to Merriam-Webster, its usage dates back to the mid-19th century, referencing the various influences from soil, climate, altitude, aspect, wind exposure, etc. that contribute to the unique character of wine grapes grown in a particular area. My 1941 copy of the Merriam-Webster New International Dictionary doesn’t include terroir sandwiched between territory and terror. Wine jargon seems to have owned the term until much more recent years. By now it’s such a common a concept that is applied to everything from cheese to (if you can believe Wikipedia) cannabis. A far more recent variation on this concept is that of meroir*, the seagoing version of terroir. 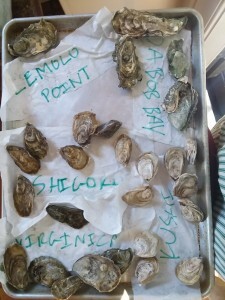 And as terroir was uniquely linked with wine grapes initially, so is it that meroir comes about with a distinct link to oysters. Of course there are other creatures from the sea whose characteristics—to some degree—are influenced by the environment in which they live. One that comes to mind is salmon from the Yukon River in Alaska. Fish that hatch in that river system are predisposed to making the arduous journey back up that long river when mature, so their reserves of fat to fuel that trek are higher than those from fish returning to more placid rivers. And we all know that fat = flavor! Or more generally, any salmon species caught off the California coast, on the Columbia River or in the Gulf of Alaska may have slight flavor, color or texture variations but they’ll be pretty subtle. Not the case with oysters. They don’t just live surrounded by seawater—as do salmon and crab and other delicious things—they are voracious consumers of that seawater. Filter-feeders, they draw through their gills many gallons of water each day, filtering out the nutritious phytoplankton and other minute particles. The types of plankton they consume have an impact on their flavor. The salinity of the water, how active the tide, the water temperature, other environmental factors contribute to the taste and texture of the meat tucked between the barnacled ruffly shells. That’s the evidence of meroir in a nutshell. 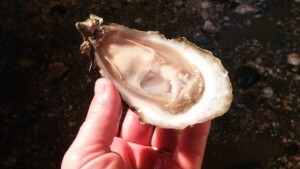 Or, dare I say…..oyster shell. A great many of the oyster growers on the West Coast are buying oyster seed or spat (baby oysters of varying ages) from hatcheries because the expense to create their own seed would be prohibitive. But it diminishes the final product not at all, because of the meroir factor. The months those little babies end up spending in their new home transform the oyster, becoming very much a product of place, not a product of where it hatched. This wonderful video produced by Oregon Public Broadcasting digs into the concept from a number of perspectives. Keep your palate alert for this evocative idea of meroir next time you sit down to a plate of just-shucked gems. * I chose to save my rant about the spelling of ‘meroir’ for a side-note rather than blasting into it straight on. Terroir is terroir thanks to its root in the word ‘terre’ which means ‘earth’ in French. The word for sea is ‘mer.’ One ‘r,’ not two. So shifting this elegant concept from the land, terroir, becomes meroir, echoing its home in the sea, la mer. Merroir just makes me cringe.